I had never planned to run the Richmond Park Marathon. It was never in my race calendar and I’d never even heard of it until the day before I ran it. I think I have been to Richmond Park once many years ago. So how and why, I hear you ask, did I come come be in one of London’s most beautiful royal parks on a gorgeous sunny morning in the middle of May 2015, only two weeks after running the Three Forts Challenge and three weeks after the London Marathon? 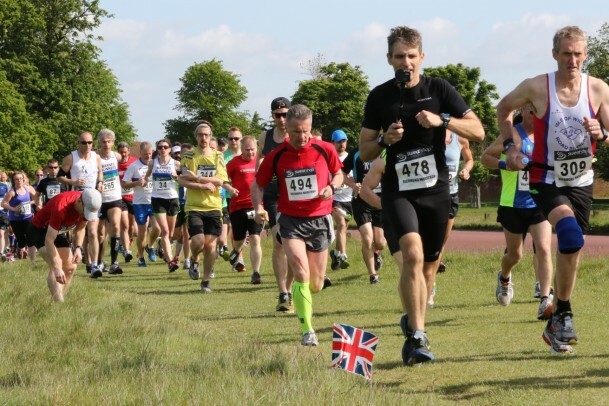 Some months ago, my runny buddy, Richard, told me he’d booked himself in to run the Arun River Marathon on Saturday 16th May and was I going to do it too. I checked my diary and I was working on the Saturday so I was unable to run. That was that. As regular readers will be aware, Richard has been out injured for some time and has missed a good few races. As the weekend of 16/17th May approached Richard commented on a Facebook post asking if anyone wanted his race number to run the Arun River Marathon. ‘Ooh that’ll be a lovely run’ thought I. ‘I’ll have it’ I told Richard. Luckily I know the race organiser and, although it says no transfers on the website, unofficially I was allowed to swap Richard’s name for mine, so I was all set. I had of course made one vital mistake. I had completely forgotten that the race was on the Saturday, which was why I couldn’t run it in the first place. I just assumed it was on the Sunday as most long runs are. It soon dawned on me why the race had never been on my calendar. What a dufus. Oh well, nothing I could do about it. But I was psyched up to run. I really needed to run. 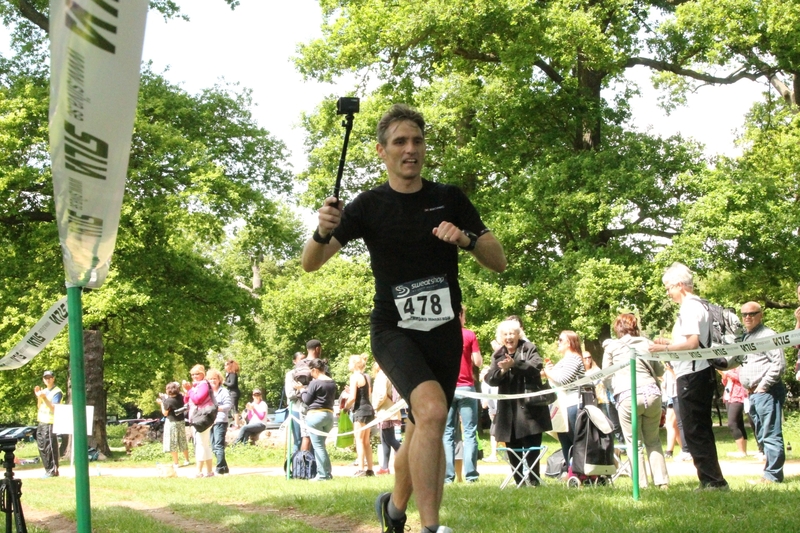 So I typed ’17th May marathon’ in to Google and the Richmond Park Marathon was the first thing to pop up. On closer inspection it looked really nice. It also didn’t say it was sold out anywhere. So I contacted the race director by phone to check. I was in! £35 seemed a little steep but I guess that’s late entry in London for you. But Gareth, one of the race directors, reassured me that the goodie bag alone was worth it and what’s more, Olympic athlete David Weir had just been confirmed to come and start the race. The guy has 6 Olympic Gold Medals and has won the London Marathon 6 times too. You gotta love that. I got up at 5:30am to make sure my toy electric car would make it to London on time. I managed to find a charge point at the NCP car park at Richmond Station and walked down to the park arriving at Sheen Gate at 8:45am. What a beautiful day. It was warm and sunny with a slight breeze. I spotted David Weir and waited my turn. He was kind enough to give me a website name check and I introduced him on camera for the purposes of my GoPro film. As people arrived I began to get a sense of a real community event. I am sure the good weather had a lot to do with it. I am also sure that Richmond Park is a very popular and well used space in a relatively affluent, middle class area. It just felt very homely and safe and relaxed. Somehow I ended up right at the front of the start line. 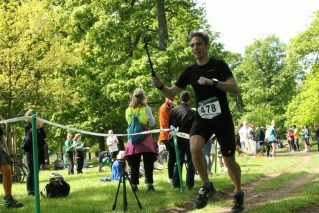 There seemed to be some reluctance on the part of other runners to make their way to the there. Still, after photos with David Weir and the official charity and sponsors representatives, the 4th Richmond Park Marathon was under way. I felt really good. I had a plan to run a steady, slow pace all the way. I stuck at 5 minutes per kilometre. I have got myself back on track with reduced carbs and fat burning of late, so I was hoping I would see some results from that. I was also aware, however, that the heat of the day may cause problems. As I ran I filmed and managed to get some nice little cameos from other runners. It’s given me an idea for my next film. Stephanie – big Frankie Goes to Holywood style t-shirt, mirror sunglasses, pink lipstick, tall – was running her fourth marathon. She also run the Country to Capital ultra in January 2015. Her friend Polly – training to be a Doctor, 20 something, on a bicycle – has recently run the South Downs Way 50. John – 100 Club shirt, mid-fifties, bronzed, smiling – was running his 116th marathon and told me that in general he hates running but marathon days are good days. Wayne – 30 something, well built, orange charity vest with his name on, tells me his running career started when he did a 10k but it escalated and got out of control. He’s now on his 7th marathon having just done London. Rima is otherwise known as the Tyre Lady and has a blog at tyregirl.com She runs marathons and ultras whilst dragging a tyre, or tyres, behind her. I first met her at the Farnham Pilgrim Marathon, which is a very tough race over the North Downs. It’s worth reading her story. I also kept bumping in to Dan Houghton (@RunningDanUK) around the course. He wasn’t running, but he always brings is GoPro along and we laugh as we film each other! I’ve recently stuck a circular polarising filter on the front of my GoPro. As yet I haven’t had the weather to make the best use of it. But today was perfect. I was confident I’d get some luscious deep blue skies and equally deep green foliage. The Richmond Park Marathon course is by no means flat. It’s undulating and there are two or three sharp inclines. It consists of three loops of the park. The first is a long 12 mile section taking you up Sawyers Hill and back through the start at Sheen Gate after 3 miles and then off out for another 9 miles past Broomfield Hill and out past Richmond Golf Club. Once back at the start for the second time the route changes to a seven mile loop known locally as the Tamsin Trail, which is essentially a full loop of Richmond Park perimeter. Two of those and the race is done. As with the Walton-on-Thames marathon I did in December 2014, we were allowed to leave our own food or drinks on a table at the start finish area which was really handy seeing as we passed this point three times during the race. As I always do nowadays, I had two sachets of Ella’s Kitchen baby food with me, which I left on said table and picked up at 12 and 19 miles. I really don’t like eating too early in a marathon. I don’t want to give my stomach any more time to get annoyed at me. Apart from the hills sapping my energy somewhat, I was able to keep a fairly even pace throughout and am pleased to report that I did not hit any sort of wall. In fact my legs felt very strong on the final 7 mile loop and I fair sprinted to the end. My last kilometre was the fastest of the whole race by a long way. 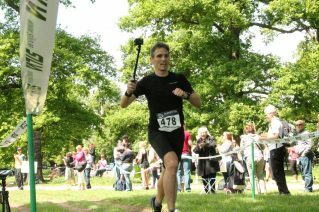 It was such an enjoyable experience coming in to the finish at the Richmond Park Marathon. By now there were lots of folk gathered and the support was really encouraging. I think the atmosphere comes across in the film and you can see how much I am enjoying it. I wasn’t going for a time, but I crossed the line in 3:32:36 and felt perfectly well afterwards. I enjoyed lying on the grass in the sunshine for a while, although that did subsequently result in my receiving a nasty bite on the leg from some creature or other lurking there. The goodie bag was indeed well stocked. Medal, t-shirt and mug along with various other paraphernalia. What a splendid day out. As much as I was sad to miss the Arun River Marathon I am equally pleased to have discovered the fabulous community event that is the Richmond Park Marathon. I shall be back next year and I shall bring friends. 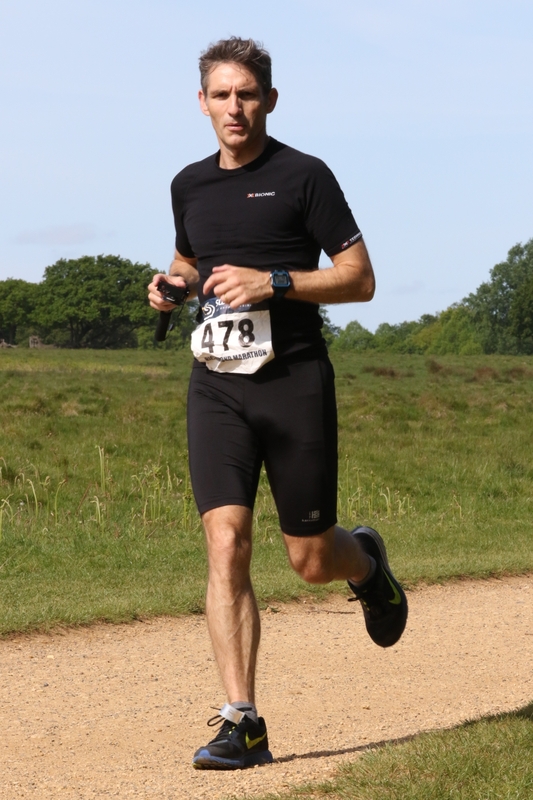 If you enjoyed reading this race report on the Richmond Park marathon, do please share it with your friends or give it a facebook ‘like’ or a Google +1. Thank you muchly.